Wondering what to do with that sprouted onion in your produce basket? What if I could show you how to use it to grow a brand new onion in your garden? Do you ever find an onion that has been at the bottom of the pile and discover it has started sprouting? Whenever I would find a sprouted onions, I used to get so upset that I had wasted food. Then one day I started wondering whether I could use that sprouted onion to grow a new onion. I found a whole lot of information saying that it wasn’t possible. Then I stumbled across this post, and it gave me new hope. I decided to give it a try next year, and I was so excited that it worked! I love gardening tips and tricks, which is why I collect gardening books like Square Foot Gardening and Backyard Gardening on an Acre (More or Less). Of course, you can get some onion seeds and grow onions from seed, but it’s so much fun to re-grow sprouted onions. The process to regrow a sprouted onion is surprisingly simple. 1. Cut carefully into the onion lengthwise to expose the center sprout. 2. Remove the outer layers of the onion, until you just have the center sprout remaining. As long as the outer layers of the onion are still firm, you can eat them. If they’re soft, discard them. If there are multiple sprouts like this one, separate them. 3. Place the onion stem into a cup or bowl of water, and leave it there until roots start to sprout. These are the beginnings of roots. I like to leave them in the water until they’re a bit longer. Also, notice that this one doesn’t have really long green sprouts. 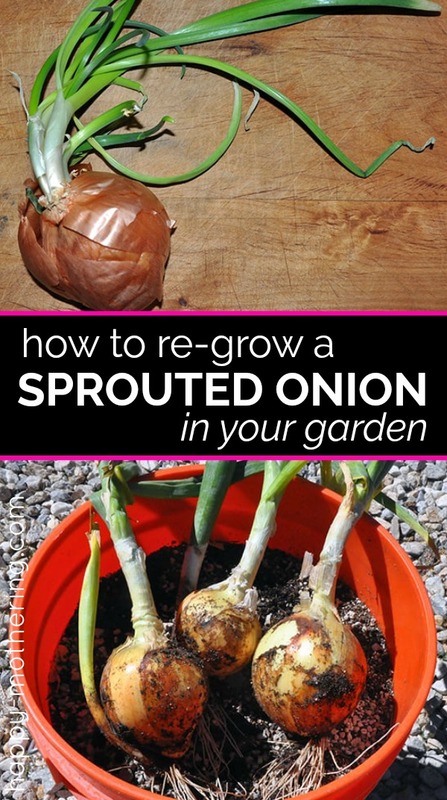 You can also cut the center out of onions that haven’t started fully sprouting and regrow them! 4. 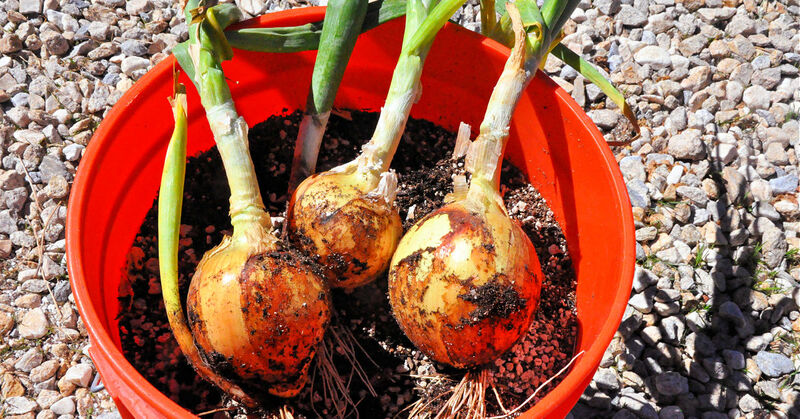 Once you have roots developed, transplant the onion into the ground or a container full of good potting soil. I didn’t separate these ones, and they didn’t grow right. Take my lesson and separate all of the sprouts before planting. 5. Let them grow through the season. 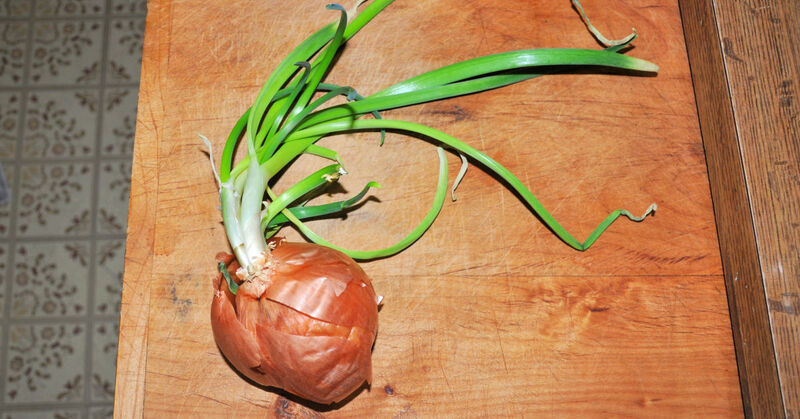 You can usually tell that the onion is done growing when you see the bulb emerge from the soil, or the green sprout starts to wilt and brown. If you leave them too long, they’ll soften and rot. If you pull them at the right time, you’ll have beautiful onions that you grew practically for free! In case you didn’t know, you can also re-grow green onions after using them! Be sure to check out Square Foot Gardening to learn how to grow more in less space and Backyard Gardening on an Acre (More or Less) to learn how to grow your own food in your backyard. 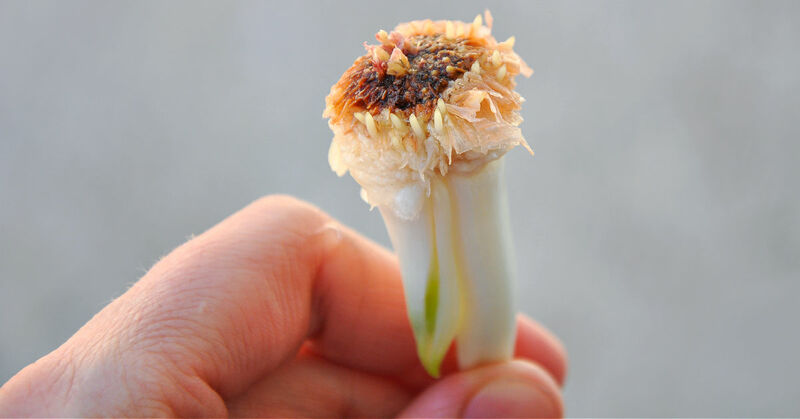 Have you ever regrown a sprouted onion? What are your favorite veggies to regrow in your garden? I just split and re-planted a bunch of garlic and onions this weekend! Thanks for the tutorial. Perfect timing! I just let one of my onions sit too long and now it’s sprouting! I actually do this with green onions and am looking into doing it with lettuce and pineapple as well as I hear you can re-grow them. TEIDT OFF yop, Remove All The Short Bottom Leaves you Will See The Roots Starting. FIG hole In cert Pineapple Stalk, covering 90% of The White Portion Of Stalk, Water Pick Your Pineapple in 18 Months +-. What a great idea! I use onions so often that I haven’t had one sprout in a while. Next time it happens though I’m going to try this! Neat! Thanks for the tutorial. I’m pinning this for later! I don’t think it works if you plant your daughter, Good luck though! Fun project. Thanks so much for sharing with us at Idea Box link party!! I’ve featured this lil’ tidbit on my blog today. Hope you’re planning on joining us again this week!! You can regrow onions, lettuce, potatoes and different other veggies from sprouts, too. It is the easiest thing. And event if your onions haven’t sprouted, you can still leave their bottom parts dipped in water, and they will sprout. 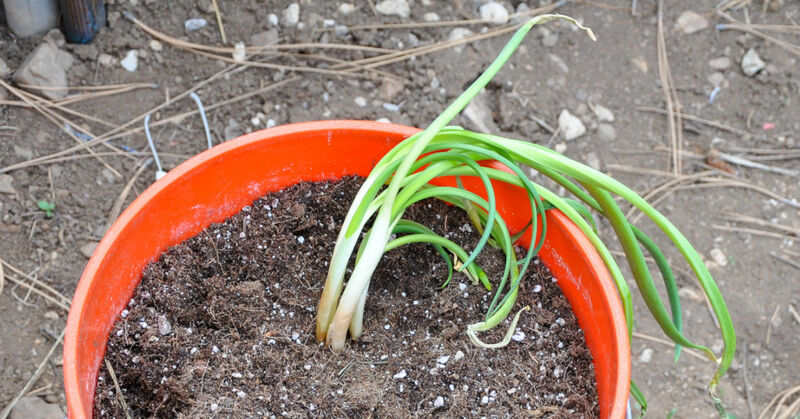 This is a very good way to maintain your green onions supplies all year round. Regards, Allison from Gardening Services London. Hi, how do I separate the sprouts without breaking them off the base? I am soooooo happy that I stumbled upon this post. It is the only post that actually encouraged me to replant my sprouting onions. I am now off to put 9 ‘starts’ into the garden. Awesome! Will you let me know how it goes? I have just found a sprouting onion in the pantry and found this wonderful site . I have put it in water and will wait to see if roots grow before going further. I had an onion sprouting and decided to give it a try. I have three bulbs and put them in potting soil. I have no idea how old this onion post is but i just found it today and I am so happy. Thank you for sharing this Chrystal! I also apologize if I have addressed this to the wrong person or spelled your name wrong. I have had this question forever. I also have questions about other veggies as well. I would love to know how to do this with potatoes. Lettuce sounds very interesting. I think I’m going to enjoy this site. Potatoes are super easy! Just let a couple of your favorite potatoes make eyes. Cut the potatoes into chunks, keeping an eye in each cube. Plant in container indoors in winter, or outside in early spring, leaving two or more feet apart. Let grow as big as you desire. The green parts are poisonous to ALL ANIMALS! So don’t let puppy play with it, and definitely don’t feed it to the hamster! Good luck! I didn’t harvest some of my onions and some of them have grown stems again where they had died off a month of two ago. I harvested most of them hoping to salvage the onions, then thought to leave a few I. hopes of finding a post about this. it’s almost October now. should I cut out the bulbs with the greens and replant them outside or wil they die in the winter cold? or should I try to grow them indoors? I have this exact question as I finally got to my onions this last weekend. Late October. I did replant the new sprouts but have no idea if this will work. The original onion was already rotting. When is about “right time”? So happy I stumbled on to this post. I currently have an onion growing in a cup I split it as well. It has beautiful green stems growing and the roots are getting longer as well. I was wondering when is the right time to plant these into a container? Also how deep do you plans them and how big of a container should I have? I’m currently growing these in my apartment as it’s winter here and plan on transferring them outside once it warms up. Thank you ? If it has roots, you can transplant it! The bigger the container the better if you have multiple onions, but I recommend at least the size of a 5 gallon bucket as I used. If it’s just one onion you plan to plant, then the container should be big enough to support a full sized onion. Thank you for answering my question on How to Grow a Sprouting Onion. I am going out to find a jar to put my sprouting onion in. 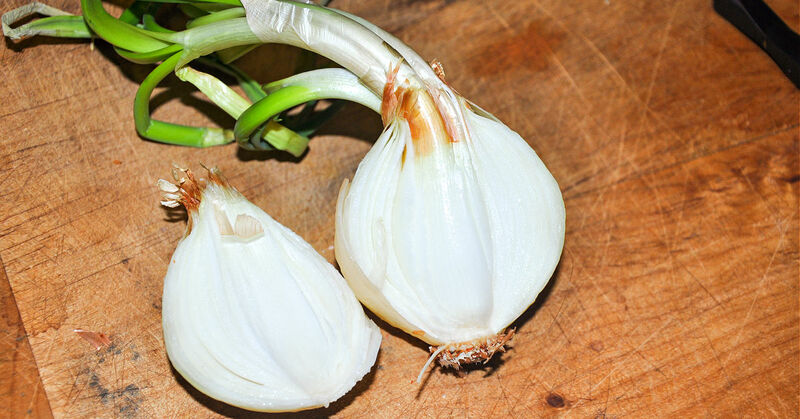 Judging by some of the comments this method is good for garlic too. Just wanted to share that I have done this with garlic in January that was “too small” to cut up for dinner for an experiment. I planted them straight into the ground as it was garlic sowing season anyway. I now have four separate plants growing which is lovely to see, given I would have composted them normally! I am now going to try this with the rogue onion I found when emptying the bag. Thanks so much! I stuck the root end of a yellow onion in a little cup of water and it is just starting to show a tiny bit of growth (maybe 1/16″ in the center…my question is this, … how and when should I transplant it? Do I cover the whole thing with soil, or does it need to have more growth first? When I processed the onion freeing the stalks I got about 6-8 stalks to root! Here goes and I hope this works. Can sprouted onions be planted now (September) or is it too late ? That’s going to depend on your climate. It would be too late for us up in the mountains. I haven’t tried it so I’m not sure. I’d be afraid of the extra white rotting. If you try it let me know how it turns out! I found a sprouting onion in the pantry and wondered what would happen if i tried to plant this .after reading some of the questions/replies i have placed it in water and wait to see what eventuates from it.I would appreciate any feedback or advice. I just found an onion sprouting in my refrigerator. I have only had it about a week so it must have been ready to sprout when I bought it , maybe? Anything that wants to live that badly gets a chance if I can help it. Thanks for your tutorial! I too sprouted red onion in water and after some root growth, planted them in pots in the house as it’s still too cold here in Indy, but out of the 4, two of the bright green stems , about 10” tall, tips are wilting and turning brown, soil is still damp? What did I do wrong? Hello, I’ve never tried this myself yet but can’t wait to try it. Some things that I would consider in your situation are: Does your container have holes in the bottom & do you have gravel at the base of the container? Does the location that you have the onions in have too much direct sun? Do they need full sunlight and how about watering? Technically, this is just regrowing an onion that went past it’s prime? 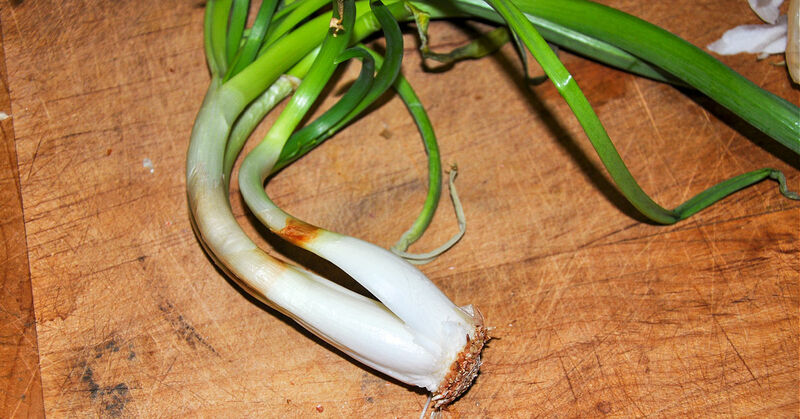 Can you cut and use the green onion leaves while you wait for the new onion to grow in the soil? I haven’t tried doing that. If you do, let me know how it turns out. I did, I just snipped off a little any time I wanted to throw some in an omellete and they’re still growing. My onions started sprouting in the refrigerator and I didn’t even put them in water to let roots grow. I just planted them outside at the beginning of winter. It doesn’t get cold enough to freeze in our winter, it’s just the rainy season for us. Both grew well but I just left them out there all year. One rotted, while the other one grew into 4. That was two years ago. I can’t believe how easy it was. This required little effort on my part. I think I’ll try it with garlic. I bought some onion sprouts to plant and I couldn’t fit them all in my garden, which was full of other plants, I was wondering if there was a way to preserve them in order to plant at a later time. No, not that I’m aware of. You can plant them in 5 gallon buckets if you’re out of room in your garden. I’m new at this and have killed many plants this may sound like a dumb question but how often do you water them after planting. Funny just found a couple of onions sprouting in my pantry was going to get rid of them and then found your web site will be trying this since I love to grow a garden. Chrystal, thanks for sharing your experiences. Found three sprouted onions that we had thrown out into the yard, so now I’m going to try your suggestions. I’ve regrown potatoes with mixed results but this sounds easier. Does anyone out there know if this would work with beets? We use a lot of organic beets and this would definitely save on the grocery bill. BTW, we are in the Chicago area (zone 5).